Today’s business climate is high-tech and fast-paced, but consumers also demand a personal touch. The 2017 Florida Public Relations Association Annual Conference will give PR and HR executives the tools needed to make sure their organization’s business is personal. The FPRA Annual Conference is the premier professional development event for PR practitioners in the state of Florida. The event will feature renowned speakers from international brands including Amazon and IKEA, as well as dynamic breakout sessions which will focus on the skills and tools PR practitioners use in their day-to-day work. View a working agenda. This is an event you won’t want to miss! Plus, a magical trip to Universal Orlando’s Wizarding World of Harry Potter is included with your full-conference registration. 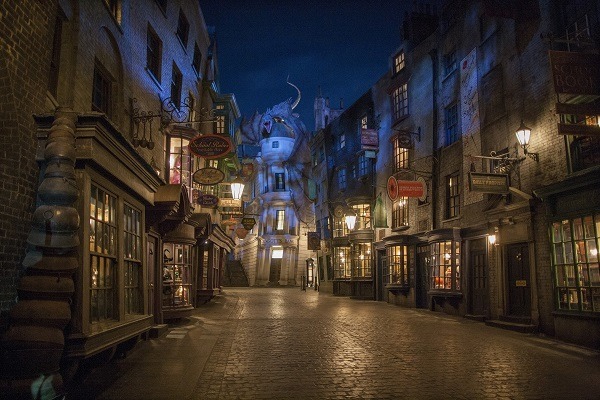 Take advantage of this unique chance to experience a private reception for FPRA conference goers at Sound Stage 33 followed by a chance to explore Diagon Alley! Sip a frozen Butterbeer, let your wand find you at Ollivander’s or even exchange your money at Gringott’s. Unless you’ve got a time-turner handy, you won’t want to miss this event! Seven meals are included with full conference registration. Attendees will receive a light fare at the Sunday evening welcome reception. Continental breakfast will be available on Monday and Tuesday and a full-plated breakfast will be served on Wednesday. Monday’s lunch is a plated meal and Tuesday’s is a boxed lunch. Dinner on Tuesday will be a plated meal. Take advantage of early bird rates today and register now … you’ll be glad you did! EARLY BIRD REGISTRATION DEADLINE ENDS ON JULY 10.